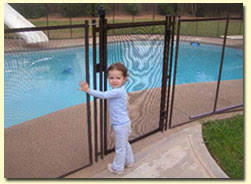 Our child safety fence is easily put up and taken down in minutes for entertaining. Our Safe n’ Secure child Safety Fence is a fantastic way to separate your pool from your children so they can play and utilize your back yard. It is another shield of protection for your family. Our custom fence stands 4 feet high and it manufactured to fit the shape and size of any pool. Our fence features a thermo safety seal which eliminates the possibility of thread rot for a longer lasting fence. Our fence poles are Quad Cores which supplies you with 4 points of reinforcement for a stronger fence. Our fence is see through and is a woven vinyl coated fabric that withstands mildew, water and soiling. Heavy duty pole sleeves are installed with every installation to tightly secure your fence. Heavy duty sleeve caps are provided for when the fence is not in use. All our fences come with a storage bag and offers an optional self closing, self latching gate. Our 2 year limited warranty is the longest in the industry. Call today to have a free in home consultation.